Helen - Professor Sophie Scott from University College London has looked into finding out what's going on in our brains when we see other people laugh. Hello Sophie. Thanks for joining us on the show today. What's going on inside our brains when we hear other people laughing? Sophie - What's going on when you hear any kind of emotional sounds, when you hear somebody screaming as well as going 'ugh' as well as laughing what we find is the part of your brain which you would use to process heard sounds is activated. Also we find the parts of the brain you would activate to yourself produce facial movements and noises is also activated. It's part of what you're doing when you hear people expressing emotions in their voices. It starts to join in a little bit with the type of emotion their expressing. Interestingly, we're finding it's much greater for laughter than it is for a highly contagious emotion like disgust. Nonetheless the laughter effect is much bigger. It seems that when you hear somebody laughing your brain is really strongly responding to an attempt to get you to start smiling. Helen - So basically your brain is getting ready to smile, even if you're not at that point of smiling. Do we know if that's what's going on really? Sophie - That's what going on. There are people who aren't smiling, they're not laughing but they're just listening to the sounds. They're told not to move or to do anything. Nonetheless even though they're being told not to engage with these sounds at all their brain is gearing up much more when they hear the laughter. We're interpreting that as the precursor of people actually starting to smile. Helen - How are we finding this out? How are you looking inside people's brains and finding out what's going on when they're hearing different sounds or other people? Sophie - We're using a technique called functional magnetic resonance imaging which is a way of taking photographs of activity inside people's brains when they're, for example, listening to different sounds or they're doing different things. Helen - Why do you think this might be? What are the ideas behind it? Why should we want to mimic laughter? Sophie - It seems to be that, obviously different emotions have different functions. Laughter has a very important function as a group activity. People like to group to laugh with other people. We laugh more when we're with other people. In fact, if you look at groups of friends talking to each other they'll try and make each other laugh all the time. It's actually something we do as a strong social bond. You'll find this in other primates. We're not the only species of monkey that laugh. There's groups of chimpanzees that do laugh. They do this in the same way to reinforce bonding. Helen - I wonder if we would start smiling if we hear chimpanzees laughing. Sophie - You would do. It sounds very much like a human laugh. You can hear that it's not human, it's different. It's definitely a laugh. Helen - Babies make laughing sounds too don't they. Do we know that's a similar reason why gurgling, happy sounds come out of us when we're still very tiny? Sophie - I think that's a very good point. It does seem to be one of the first kinds of behaviours that really emerges. Children often cry from the moment they're born but babies start to smile and laugh around six weeks. That seems to be a really important function for establishing close bonds with their care givers. Parents are always absolutely thrilled when their baby starts smiling and laughing back at them. Then they'll really go miles to try to get the baby to laugh. It's got this really strong positive bonding quality. Helen - Presumably we do feel good when we laugh. Is that part of it as well? 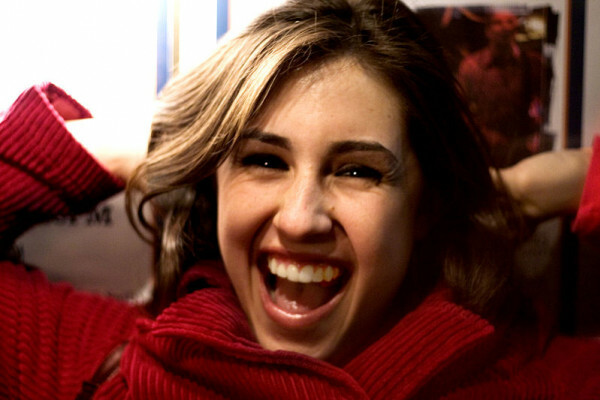 Are there hormones that are making us feel happy when we laugh? Sophie - Absolutely. And I'm supremely unqualified to talk about them but I'm talking about the activity side of the brain. I'm not really addressing the chemical changes but undoubtedly there's going to be all these feel-good hormones. It feels great if you sat and talked to good friends and have a good laugh. It's a lovely feeling. That's going to be one of the things that's enforcing the quality of the interaction. Helen - We think that maybe we've been laughing longer than we've been talking. Is that right? Sophie - There are some people who've argued that because you find laughter in other primate groups and some people have argued in other mammals. Laughter would be one reason for us to get together and have social bonds form between us even before we talked to each other. It's something we could do as a group of people before we could even necessarily have words. Helen - I like the idea of wordless Stone Age jokes, wonderful! There are different types of laughter, aren't there? We think about laughter just being something to do with a joke or something that's funny. We laugh when we're nervous or perhaps as cruel laughter as well. Do you think the brain's going to respond differently to different types of laughter? Sophie - I think this is almost certainly going to be the case. I'm just looking at one type of laughter. We were taking quite genuine sounding laughs that didn't have any particular quality to them. There weren't any evil laughs or nervous laughs. When you consider that people actually laugh in lots of different ways. If you ask what makes people laugh they will tell you different things. In Germany people will give you a different answer than people would here. That's associated with different qualities of laugh that people in different cultures are better attuned at hearing. I think there's undoubtedly a whole story within this of different kinds of laughter and different ways that we use it. Helen - Is it all about the sound of laughter or if we look at someone else or see someone else laughing. Is that going to give us a similar response in our brains? Sophie - I think so. You must have had the experience of sitting in a meeting and you can see in your peripheral vision that one of your colleagues has started giggling and they're not making any noise yet but they're shaking in the way they're laughing. It starts to have that effect on you. I think it's something that's not bound to be expressed in the auditory modality. Helen - Sometimes people make nasty sounds: screaming and retching. You said there wasn't such a strong response. We're not pulling a face as much or preparing ourselves to pull a face when that happens. Sophie - There was a degree of an effect there but it was a much less strong effect than the negative effects we looked at. It did seem that there's a little bit of understanding emotions made by other people seems to be that you engage motor areas - these areas you'd use to make actions yourself. They're much less strong than they are for these positive emotions like laughter. It can't be something to do with the contagion of emotion itself because we know that disgust is really contagious. If you're with somebody who looks at the bowl of food and goes 'ergh' you're going to feel a little bit sick. You'll probably not want to eat that food yourself. It's very contagious but it doesn't seem that when they go 'blergh' you have to start going 'blergh' as well. Helen - Just as well to hear them! Where are you going to take this next? Are you going to start planning to look at more detail at what is going on inside our brains when we're preparing to laugh and smile? Sophie - There's all sorts of things we're trying to do with this. One of my colleagues who's been working on this since I started has been off looking at laughter in other cultures. She's been off working with people living in very un-westernised societies in the Namibian Desert. Lo and behold they actually laugh in the same way. It is interesting to look at the really strong commonalities across groups. It's also interesting to start looking at these things in terms of understanding normal and abnormal brain function. Can we find some of these patterns of these responses to very positive emotional noises; are they reduced in any particular clinical groups? People who really aren't finding life very funny, are they showing depresses responses?